Septic arthritis refers to the infection of a joint. It requires a high index of suspicion and can affect both native and prosthetic joints. Bacteria will ‘seed’ to the joint from a bacteraemia, a direct inoculation, or spreading from an adjacent osteomyelitis. Such an infection can cause irreversible articular cartilage damage leading to severe osteoarthritis. In this article, we shall look at the risk factors, clinical features and management of septic arthritis. Patients will most commonly present with a single swollen joint causing severe pain. Pyrexia will be in around 60% of affected individuals (although its absence should not rule out septic arthritis). On examination, the joint will appear red, swollen, and warm, causing pain on active and passive movements. An effusion may also be evident. Often the joint is rigid and the patient will not tolerate any passive movement at all, and will be unable to weight bear. Routine bloods including FBC and CRP, should be sent, alongside ESR and urate levels. Blood cultures should also be sent (at least two separate samples), especially in those with pyrexia. For those suspected, a joint aspiration should also be performed. 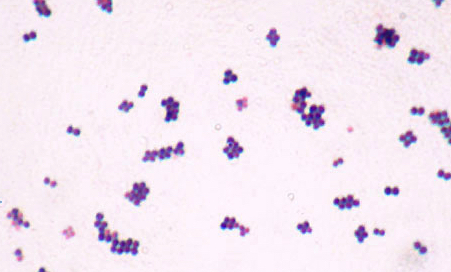 Joint fluid analysis should also be sent for Gram stain (Fig. 2), leucocyte count, polarising microscopy, and fluid culture. It is important that cultures and joint aspiration are sent where possible prior to starting antibiotics (unless the patient is overtly septic). A plain radiograph of the affected joint is often performed; whilst in early stages, no evidence of the disease may be present, it may eventually progress to demonstrate capsule and soft tissue swelling, fat pad shift, and joint space widening. Further imaging is rarely performed*. Ultrasound imaging can be useful to guide joint aspiration and for drainage (particularly for the hip), whilst CT/MRI imaging is a very sensitive method in assessing joint damage, typically used if there is a difficulty in the diagnosis. *Radionulcide scans can be useful in identifying septic arthritis in isolated joints, such as the sacroiliac joint. Any septic patient should be managed as appropriate, with early resuscitation and investigation provided. Empirical antibiotic treatment should be started as soon as possible, after appropriate investigations have been completed. As a guide, antibiotics are typically administered for long term (often 4-6 weeks), initially intravenously. Most wounds will require surgical irrigation and drainage (‘washout’) in theatre to aid in source control. The main complications of septic arthritis are osteoarthritis and osteomyelitis. Early intervention and management will reduce the risk of developing these complications.